Ask any parent. Once you have a baby, your life is not your own. As a mother, I understand this. And as a homeowner, I understand it all the more. Five months ago, my husband & I adopted a baby. His name is The Dole House. And although 250 years old, he is every bit a clapboard clad toddler w/a perpetually leaky diaper. He whines, he cries. He begs to be changed. And much like our other babies, he has taken everything we’ve had to give and more. When we first moved in, I felt as if I’d been swallowed whole, and now, five months later, I am still being digested. 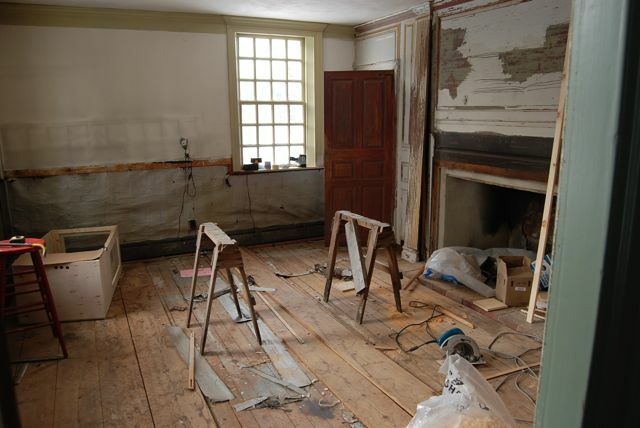 Like parenthood, the process of restoring and updating such an old house is time intensive, financially draining, emotionally wrenching and physically demanding. It has consumed us completely, often to the point of near exhaustion. But, on occasion, much like parenthood, the moments of gut-busting angst give way to feelings of great accomplishment. Like now. 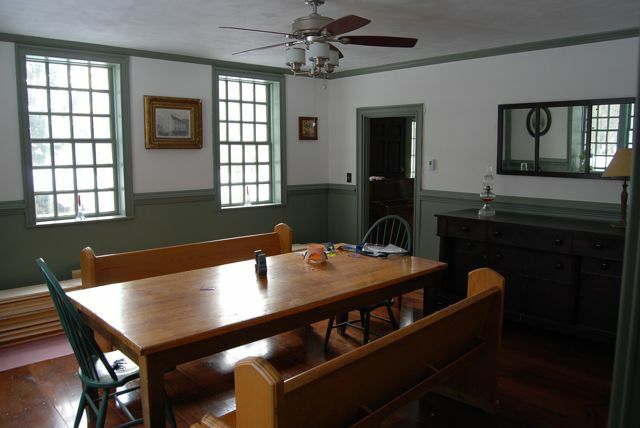 As I present our new Dining Room. August 28th, we adopted The Dole House. 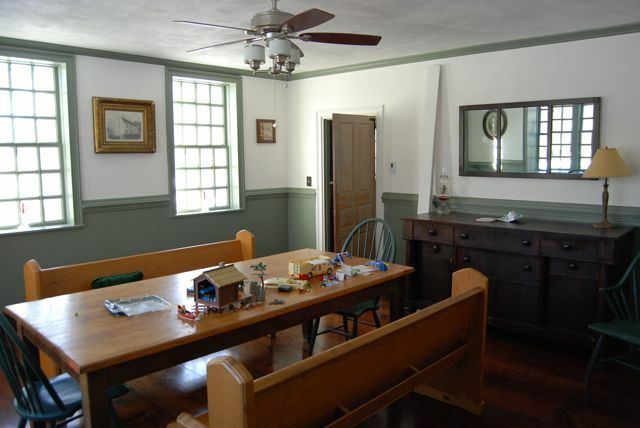 Our (to be) dining room had only partial walls & plywood floors. We were in equal parts excited and overwhelmed. Work began in early November. 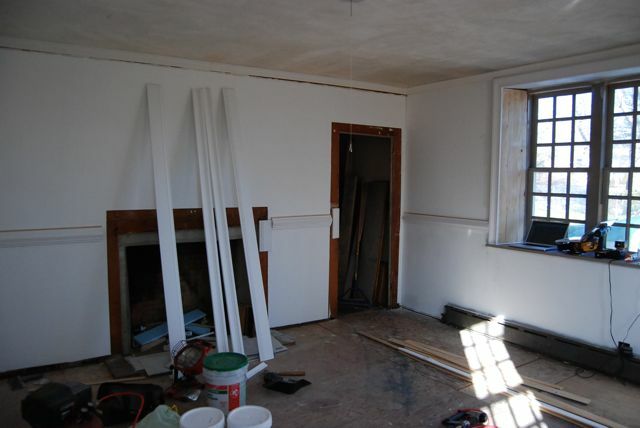 Down came the old drywall. Unfortunately, 2 other projects took precedence at this point. Re-tiling our upstairs bath (so we wouldn’t fall through the floor) and then lining our chimney & installing our wood stove. 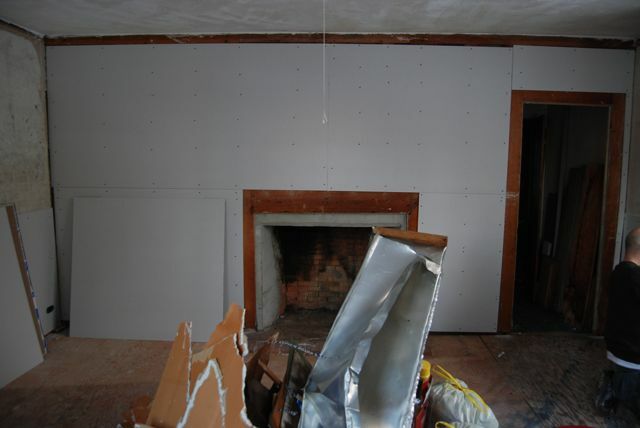 Work resumed December 6th, and up went the new drywall. FINALLY! Joint compound is applied to cover all the cracks. 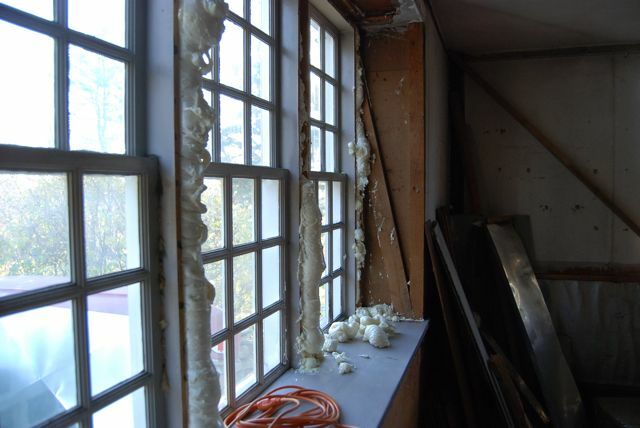 My husband had to rebuild all of the casings around the windows. 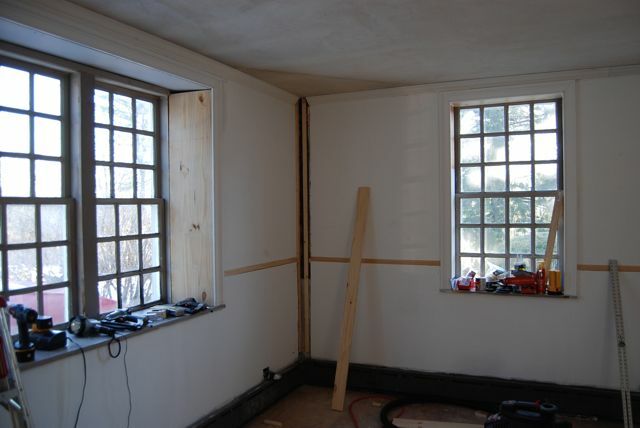 He took special pains to insulate the walls thoroughly, and after installation, he caulked every gap. Next we installed a multi-piece chair rail around the perimeter of the room. 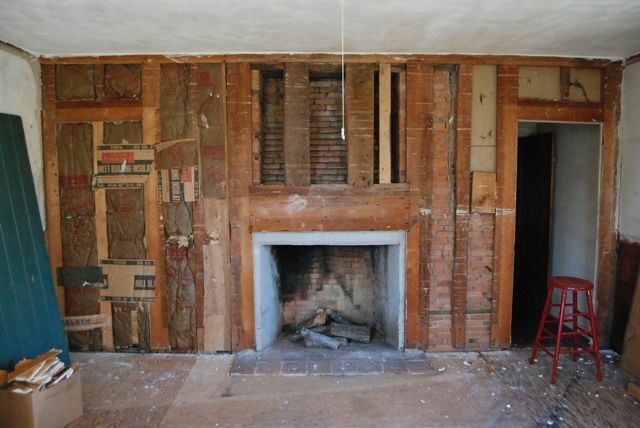 We had to rebuild a mantel casing around the fireplace, again using multiple pieces of mill work. 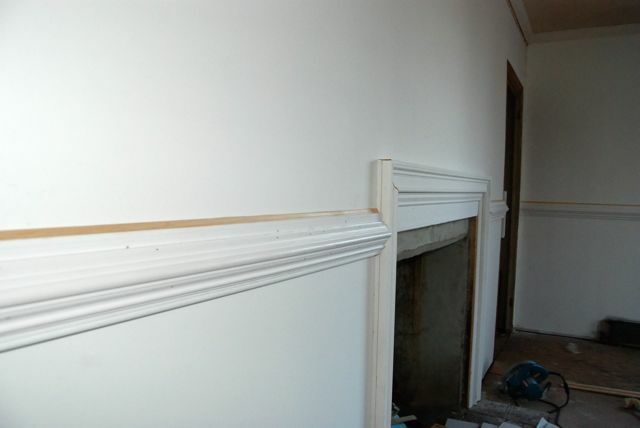 We also at this point installed crown molding. Which I did NOT document b/c of the agony involved. Suffice it to say, if you know what coping is, then you KNOW WHAT COPING IS! 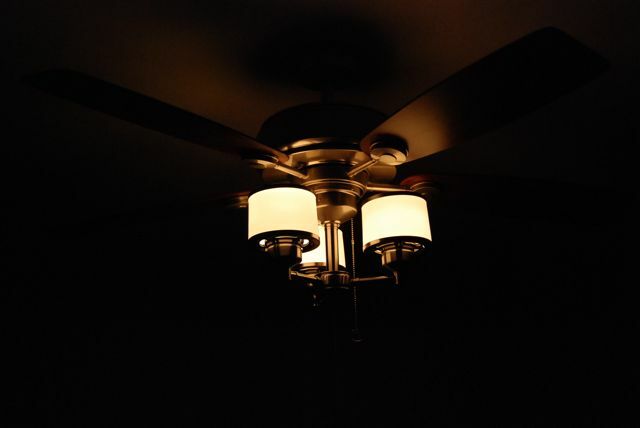 Next, we installed a new light fixture. In between this we ate lots of smiley face sandwiches. B/c encouragement comes in many forms. Next up, the floor. 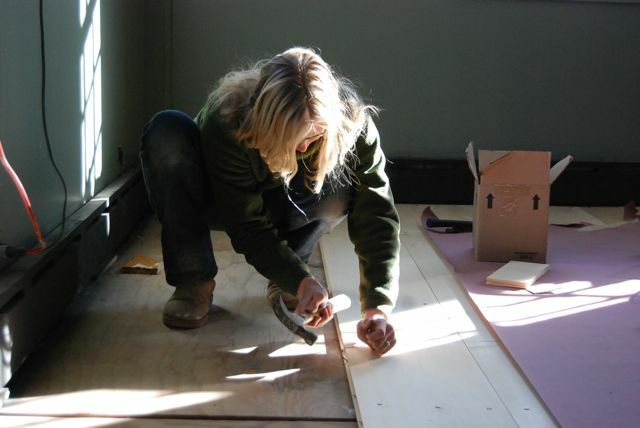 In October we’d invested in wide plank flooring from Carlisle. 9 to 17 inches, white pine. 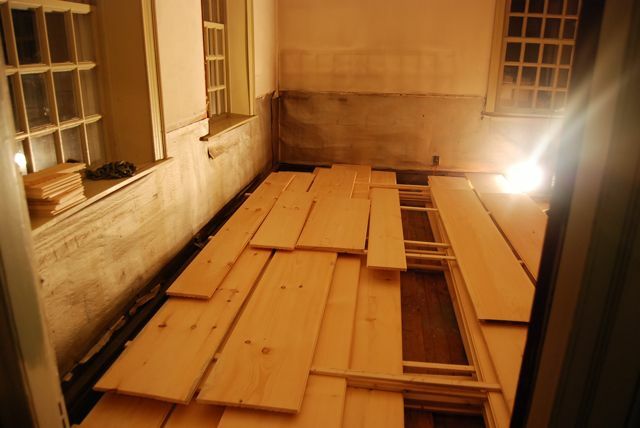 The boards had been stacked and acclimating to the humidity level in the adjacent unfinished room. 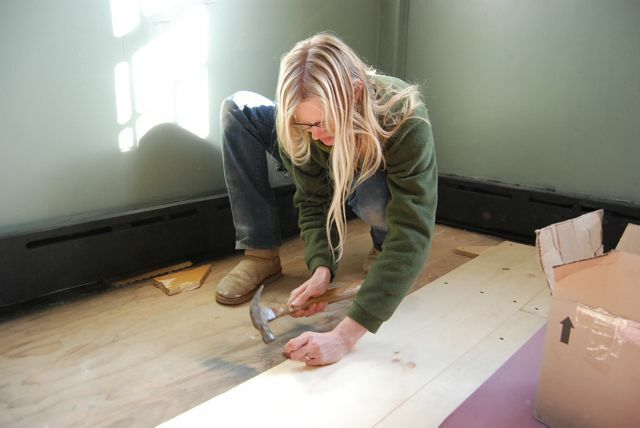 Before installation, my husband leveled the plywood floor. 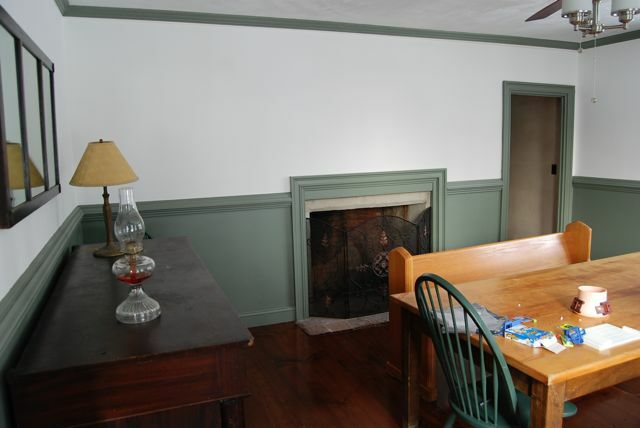 Basically by jacking it up in several spots from the basement below. In order to know where to nail, we had to mark the beams. 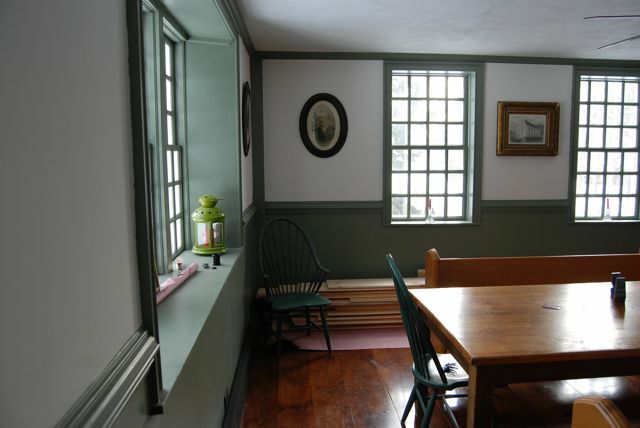 We did this by drilling small holes through the beams as guides, from which we marked chalk lines across the floor. 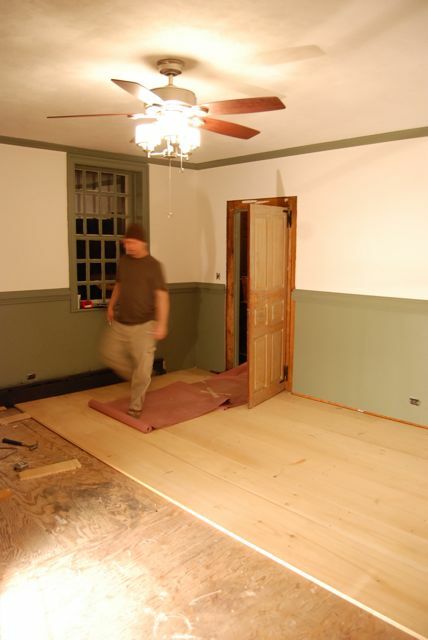 Then, board by board, we laid our new floor. which I couldn’t help but play with. NOTE: in addition to great season’s greetings, they also made a superb jingle bell noise when shaken in my pocket. Finally the floor was IN. Now onto staining and sealing. Which we’d decided to do ourselves in order to save $$$. Here is my husband in his boxers. You do not get a picture of me in my underwear. We finished staining and sealing the floor (I kid you not) two days before Christmas. My family arrived the very next day (Christmas eve) for a 2 week stay. To say we were stretched beyond our limits would be putting it mildly. A normal Christmas would see me baking umpteen dozen cookies. Sending cards. Wrapping (and buying) elaborate gifts. This year I baked NOTHING. Sent zero cards. And the modest presents I did give were wrapped at the last imaginable minute. It was a strange holiday. But I am proud to say THAT YES!! 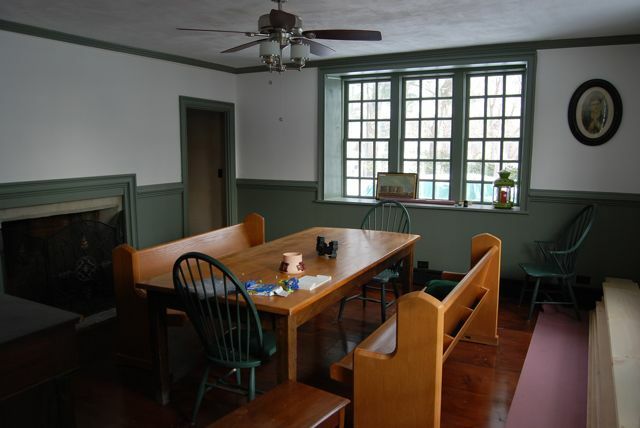 We ate Christmas dinner in our NEW DINING ROOM. All else be damned! 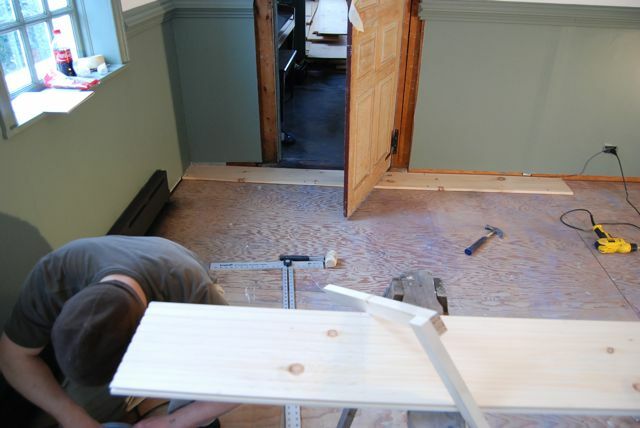 Over holiday break, my husband installed the door casings and then finally the floor base molding. Which I then had to PAINT (again w/ the painting). Here is the room today. January 25, 2010. D-O-N-E. Thank GOD ALMIGHTY! This sketch of the house was my Christmas present to my husband. It was done by an artist we knew in Philly and I actually commissioned it waaay back in August – before we even bought the house. I found the frame in the attic after we moved in. 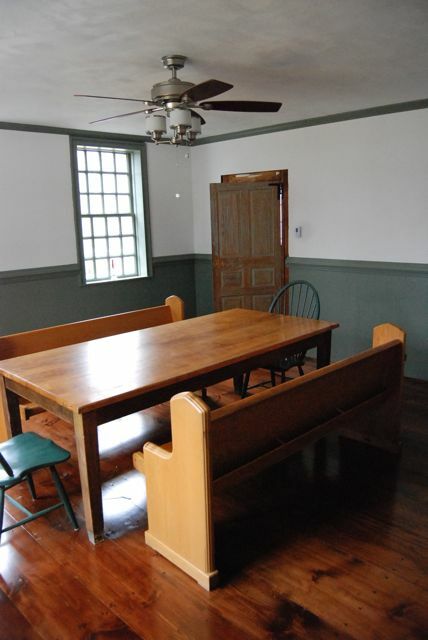 The table you see in the photos is a re-purposed work bench we’d previously had in our basement. I bought the green chairs from an antiques store here in Portland. And we found the benches on Craigslist. 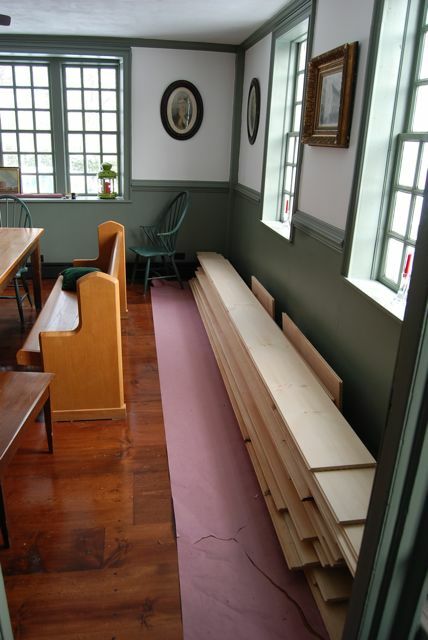 They’re church pews from a convent in southern Maine that’s being sold. Isn’t it amazing how pieces just fall into place? As you can see in this last pic, there are STILL more remaining boards. That’s b/c have another room to finish. Up next? The room across the hall. Our (soon to be) office. Stay tuned! < Previous It’s Official. I am a yogurt groupie. That is so lovely! Well done you lot! It looks vintage and original. Do you hire out? Your post was well written as well. You had me going for a bit thinking you had adopted a child! Thanks so much, S. Le! 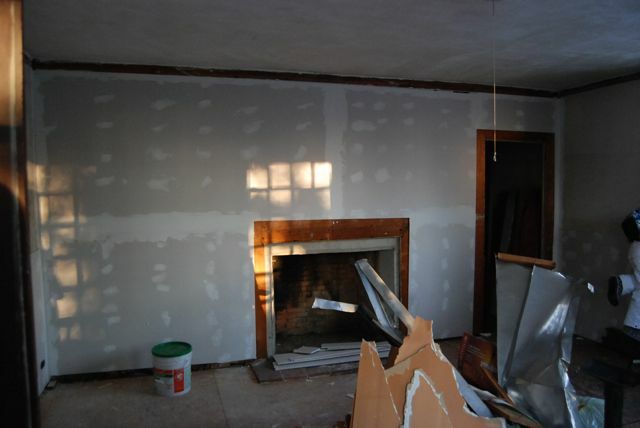 We’ll be happy to do contracting, as soon as our own house is in order. Anyone in Portland? Keep us in mind! My boyfriends back and you’re gonna be in trouble! Hey now, hey now! Oh, House, when you came up in m reader I had to catch my breath. “Could it be? !”, I asked. You were handsome before, but with your facelift and [equivalent of a] spray tan, you’re damn near affair-able. I bet you’re toasty warm and like a good book. 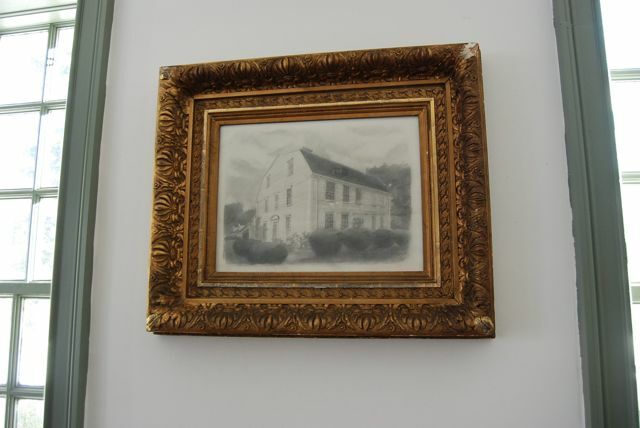 Not to mention that you mom rocks out with her antique finding and sketch commissioning. 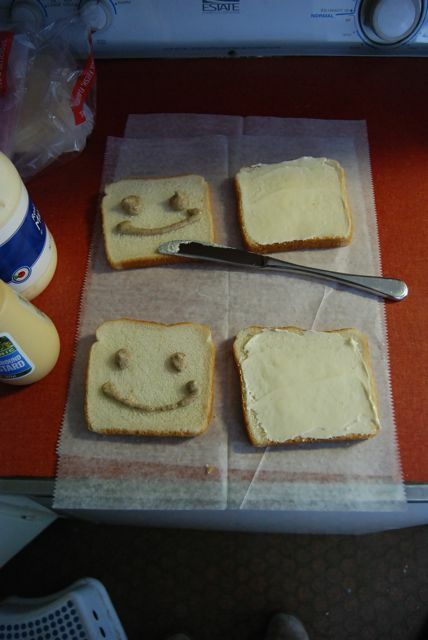 And her smiley sammiches. 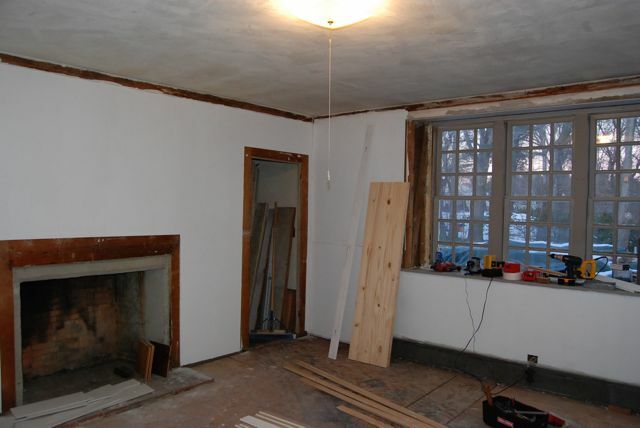 Oh, and let’s not undersell your Dad who clearly has mad renovation skills. Steph – you made me LAUGHHHH! And the House is positively blushing. Thank you. stunnnnning! you guys are absolutely insane but it looks great! i love the floor and the pains you’re taking to be authentic. ps. what happened to the pizza post? Oh Nat, you crack me up. The tile will wait. Or, perhaps one day you will be overcome by an overwhelming urge to tile? Now you are laughing too! 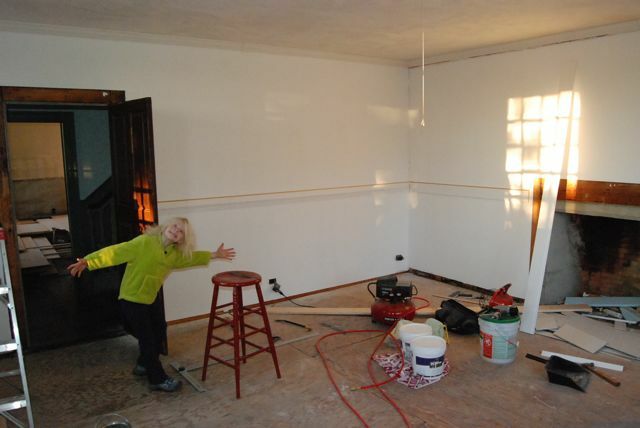 Thanks for the love babe – we are so happy to be done w/ that room, I cannot tell you. Now gearing up for the next one. We may be close to certifiable by the time that one’s done. 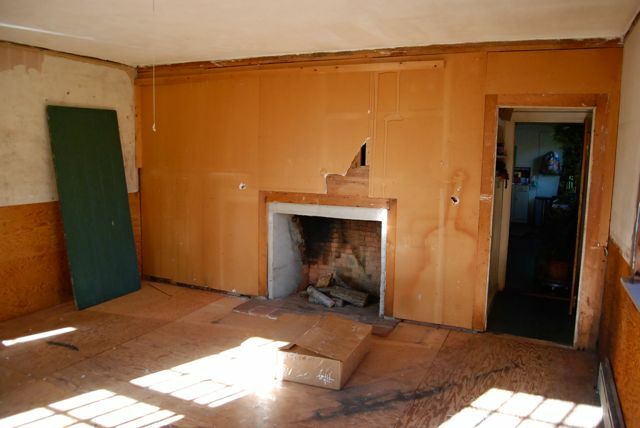 My mom keeps urging me to contact This Old House for the kitchen redo.. We’ll see. As for the pizza post, no one responded and the photo kept making me HUNGRY. So I took it down. You don’t by chance have a good recipe? we were discussing taking a little road trip up your way in may or june…. Oooh *CHRISTA! * Welcome to the Dish! Many thanks too. You know you & Mike are always welcome. 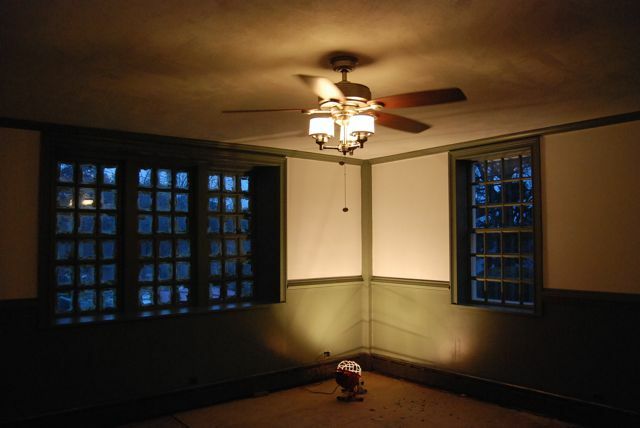 And hopefully by spring we’ll have a gen-u-ine guest room! WOOT! Love ya babe! You betcha girls – and don’t forget those bathing suits. Come summer, it’s time to PAR-TAY! I’m gonna hold you to it. Many thanks Abbie!! 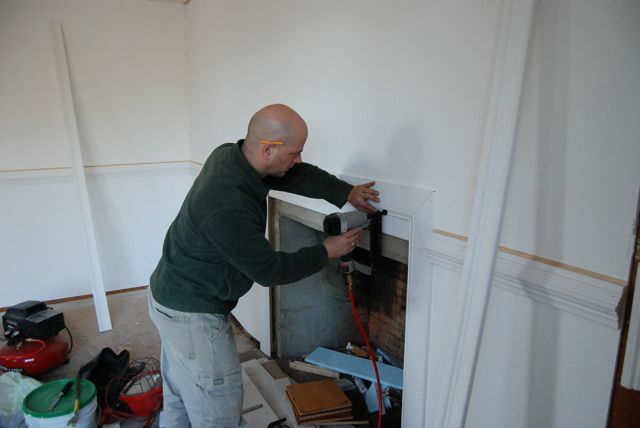 John has no formal training as a contractor, just an incredible determination to get things done. His motto: “Whatever it takes, Dude.” He spends hours each week reading up on whatever we’re tackling next.. or eventually. 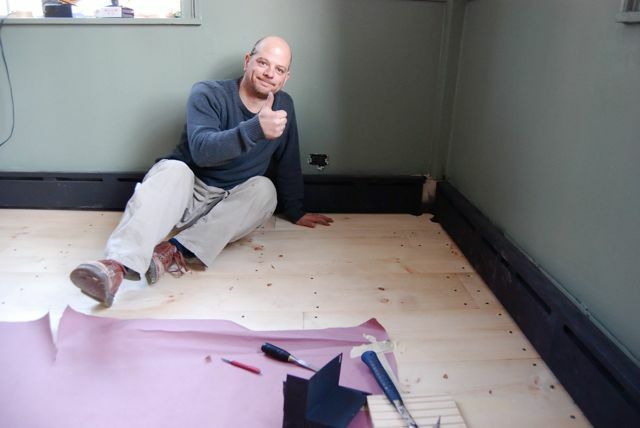 He’s studied every topic imaginable from radiant floor heating to completely rewiring a house, and so much more. John has an insatiable thirst for knowledge which helps inspire us all. And he always researches options thoroughly before deciding on a course of action. My husband truly is my superhero. 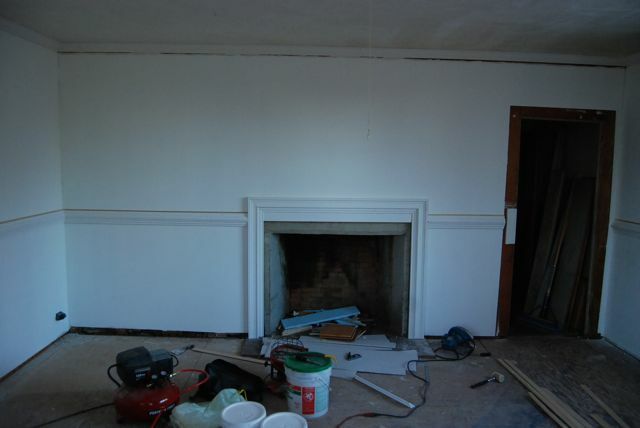 As for the working room (our to-be office / music room) John has already started with the paint on the fireplace wall. He has been taking pains to scrape it gently, has even devised a mechanical means of doing so. We’ll see how things go. We want to keep that room intact as much as possible, but have to be very careful w/ regard to paint toxicity & the girls. W/ regard to your own mudroom project – GO FOR IT! Do like we do. Go to the library and check out every book you can find on the subject. Pour through, make notes, plan, plan, plan. And then just do it. Don’t be afraid of making mistakes. It’s all part of the charm. I read a wonderful story recently. A man talked about building a brick wall composed of a thousand bricks. He focused for years afterward on the the three he hadn’t laid perfectly. The flaws made him so sick, he couldn’t even gaze upon his work. Finally, a wise man reminded him. Yes, those 3 bricks, they aren’t great. But what about the 997 other bricks you laid PERFECTLY? He finally saw all the beauty in his own creation, and the 3 “bad” ones finally fell away. Today, he can’t even find them. Remember that story Abbie. Best of luck! Oh my! Don’t those legs look fine and sturdy. The way the material wraps around the buttock! Very nice. You guys have taken on an huge project but if anyone has the motivation and abilty to get it done… it’s you guys! Hope you had a wonderful birthday! and THANKS!! Ok, WOW. And here I was complaining about the Love Bungalow! 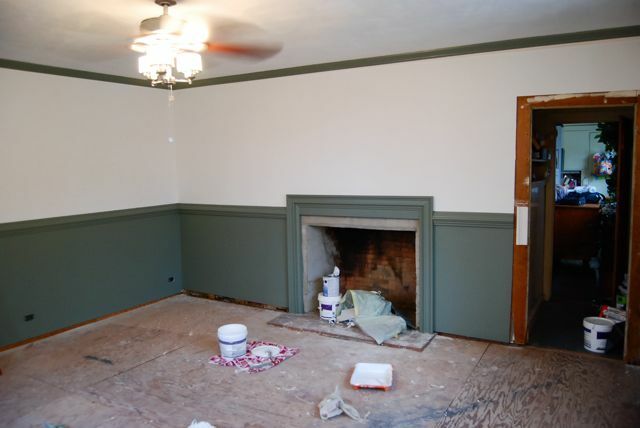 We’ve got nothing on you – geez – ya’ll stained your OWN FLOOR. I am so impressed! It’ll be so awesome for the SLOB Slumber Party!! YAY! Slumber parties are SO MUCH FUN! We can do each others hair, and eat popcorn, and drink WINE, and watch horror movies, and bake cookies, and drink some MORE WINE, then hit each other with pillows and…WOW!!! Can’t WAIT! Kate, what can I say but THANK YOU! Truly. The work is exhausting, but it’s worth every minute. Sometimes, when I feel like I JUST CAN’T DO ONE MORE THING – I imagine your dad there beside me yelling DAMMIT! Get to work girl. And I do. Hello from the Blogger at Carlisle Wide Plank flooring! 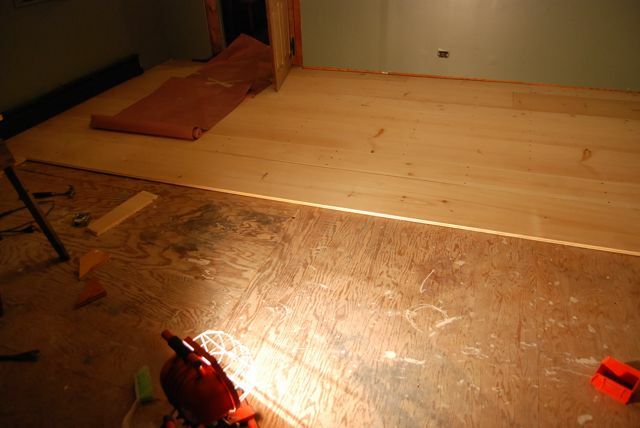 We were thrilled to see this record of the installation of your floor. The whole room looks beautiful. You and your husband did a great job. We will be linking to this on our blog some time in the near future, but for now we just wanted to say thank you for choosing Carlisle and for putting as much care into your home as we did into the wood. WOW Chris – Thanks so much! Chez Ellingsworth looks absolutely incredible! The thoughtfully framed picture will undoubtedly become a talking point with guests and be something they’ll always remember about your house. 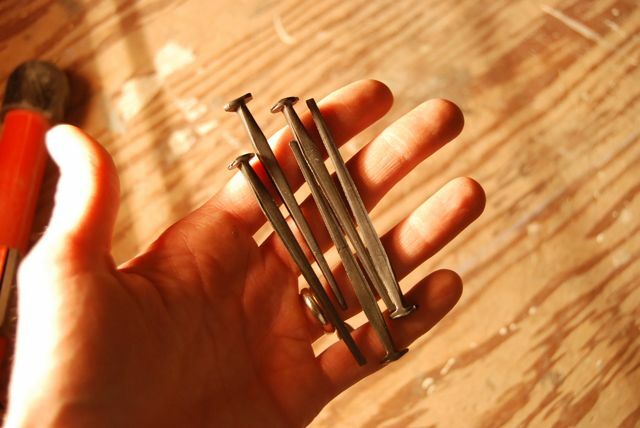 I’m curious – what other long-lost treasures did you find in your house after moving in? I do also need to say that you’re my newest inspiration. We’re in the midst of finalizing architectural plans for a major reno/addition on a 70-year old brick colonial we recently purchased. To say that I’m a bit fearful would be an understatement! Looking forward to the next installment of “If These Walls Could Talk”! Aww thanks Kate. Bob & Jane (from next door) just brought us over a calendar & bookmark w/photo and history of the house. that is amazing I cant wait to come see it. that green is such a beautiful color! WONDERFUL WORK! Thanks so much!! 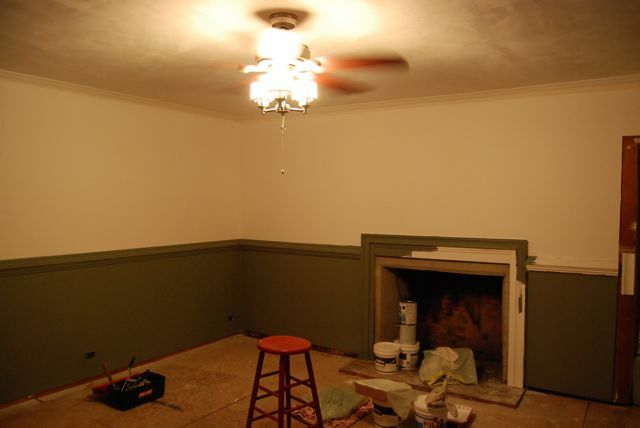 The color is called ‘lincoln cottage lattice green’ – it’s an historic trust color. We love it too!